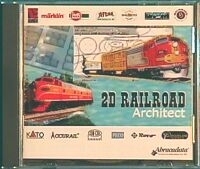 2D Railroad Architect from theliquidateher. System Requirements: Windows 2000/XP/Vista/ Win 7/8/10 info, 16MB RAM. CD-ROM, 256 color monitor or better (16-bit or higher recommended). Using custom track or manufacturer track pieces to create a to-scale precision layout or template has never been easier. This program offers over 60 manufacturer catalog listings, over 15 actual track libraries, and many building/scenery objects. It supports NMRA scales, metric or English measurements, on-screen grids and rulers, flex track, drawing tool, text tools, and it includes ready-to-edit libraries. For you modelers that don't require 3D views of your computer-generated layouts, this is the program you need.